Do you have caller ID on your phone? If not, GET IT!!! In these instances, and others, we are instructed by an automated voice to buy a “cash card’ in a certain amount, then return their call and give them the card number. Also, calls from every charity imaginable, former schools, and companies supplying Medicare devices, some of which don’t leave a message, and calls from locations, area codes and phone numbers we do not recognize. We have even had calls with our own name and phone number displayed, and, again, an automated voice tells us we have to pay, or else! I’ve heard or seen media advice to, “Don’t answer the phone unless you recognize the name or phone number displayed” and “If you answer the phone, they know the number is valid and will keep calling’, and “If you answer the phone, don’t speak until you recognize the caller.” Sounds good. So…if you have called me, The Editor, and I haven’t answered the phone, I apologize, but please leave a message. Either I didn’t recognize the name or number, or I was in the basement hiding from the phone. 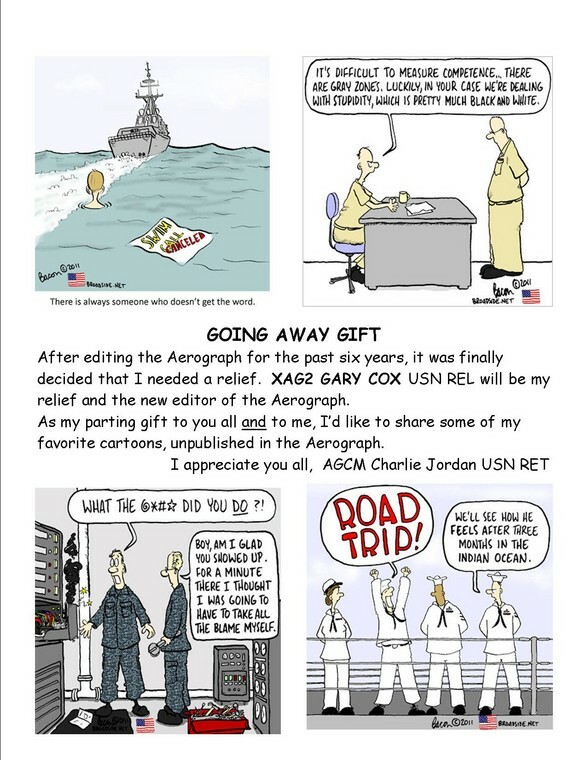 The cut-off date will be Monday, 22 April 2019 for the May issue of The Aerograph. GET YOUR AEROGRAPH BY EMAIL! !